I’ve written about this on The Billfold before, but Your Money or Your Life changed my life. (Arguably, it led me straight to my current career.) I read it shortly after I graduated from college, when I was working as a telemarketer and trying to figure out how to save enough money to… well, to save money, for starters. I was inspired by the idea of financial independence, partly because I wanted to have the freedom to make art and partly because I hated telemarketing and wasn’t qualified to do much else. 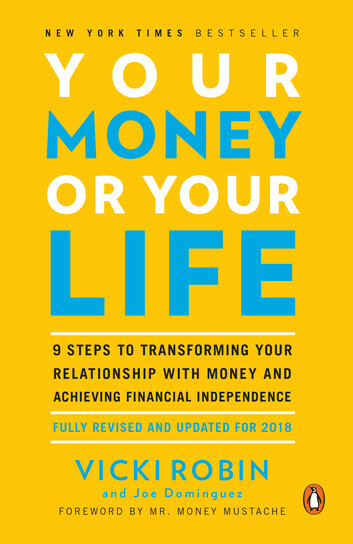 I also appreciated that YMOYL — yeah, that’s what the cool people call it — broke the process of achieving financial independence into a series of simple steps. Step 1: track everything you earn and everything you spend. I immediately started tracking my finances — and never stopped. I also began looking for ways to increase my earnings and decrease my expenses, which at the time meant doing things like “only riding the bus during off-peak hours” and “eating peanut butter and raisin sandwiches because raisins were cheaper than jam.” I got out of telemarketing and into receptionisting, which paid a few more dollars an hour and required slightly less time on the phones. I also got really into personal finance, which… well, here we are. YMOYL was originally published in 1992, and as we approached the Great Recession, its path to financial independence started to feel a little dated. Interest rates dropped, and treasury bonds, while still low-risk investments, were no longer yielding retirement-level returns. I read the 2009 updated edition, but there weren’t a lot of significant changes to the methodology. You still needed to save more than you earned, which was becoming harder every year — a fact that I was well aware of, as I was tracking both my cost-of-living raises and the annual fixed increase in my cost of living (rent, health insurance premiums, etc.) — and find an investment source that offered decent, stable returns. The new YMOYL also stresses financial interdependence. A community of people can share resources and support each other, so building your community is just as important as growing your income. I had the opportunity to talk with Your Money or Your Life co-author Vicki Robin, and I will admit that the very first thing I did was gush about how much her book had influenced my life and how grateful I was that she and the late Joe Dominguez had written it. Then I asked her about health insurance. How do rising premiums and health care costs fit into the concept of financial independence? Robin explained that she was now working on the idea of FI For All: promoting policies that would allow everyone to become financially independent, not just people who could afford to both purchase and then sell off their assets. The first policy on the table? Medicare For All. Building on Robin’s discussion of low-hanging fruit, I noted that consumer goods are now less expensive than ever before (adjusted for inflation, etc.) and services are more expensive than ever before — an idea that I may have lifted from a recent Indicator From Planet Money podcast — which means that selling your second car becomes less valuable compared to the annual increase in rent or education costs. How can we achieve FI knowing that the fundamental costs of living are rising at such an extreme rate? Robin explained that, these days, we all have to think of ourselves as independent contractors. The basic tenet of YMOYL — increase your income, decrease your spending — still stands, but we have to be strategic about how we choose to earn and spend. “You have to be entrepreneurial and alert to opportunities.” Maybe this means taking on a side hustle. Maybe it means choosing not to go to college. What we can’t do is trust our future to a single profession or corporation. The last question I wanted to ask was about the math of financial independence. I got out of debt in 2016 and have been living on 50 percent of my income for years, but I’m nowhere near having enough money to live off my investments. How does a person stay motivated to work towards that kind of goal, knowing how mathematically difficult it will be to achieve it? At this point I said that I was hoping that I’d have $100,000 saved by the end of 2018, which I realized was a ridiculously ambitious goal as soon as it exited my mouth — my current net worth is $76,157.86 — but now that I’ve written it on The Billfold I have to figure out how to make it come true, right? Luckily for me (and the rest of us), Robin said that there were other ways to increase our net worth — and they didn’t necessarily involve money. That’s my other goal, for 2018. Building my community. Also, recommending the newest edition of Your Money or Your Life to as many people as possible.